Dividend growth stocks typically leave themselves some wiggle room in order to lessen the probability of a dividend cut due to earnings volatility. That’s why normal recessions don’t stop them from increasing distributions. They do pay out lower yields, but the dividend payments are stable, growing and you know that the cash, which the company generates, is also reinvested into the business. The balanced approach of rewarding shareholders while also growing the business is very appealing to income investors who are looking for an inflation proof form of dividend income. 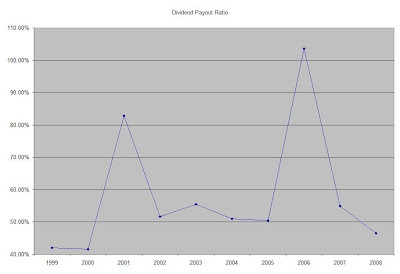 Investors who selectively purchase from the dividend aristocrats, dividend champions or dividend achievers lists are true visionaries who do not chase high current yield but look for stable, wide moat businesses which could generate enough earnings in order to support long term earnings and dividend growth in addition to expansion of the business. Nobody ever bought Wal-Mart (WMT) for its yield – yet it has been one of the best performing dividend growth stocks over the past 3 decades. High Yield Canadian Royalty Trusts on the other hand pay all of their cashflows out as dividends. They grow by selling more units and diluting your stake. There is also some uncertainty about the tax structure of the income trusts after 2011. Currently there are imposed limits on the amount of units Canroys could sell in order to maintain their current status by 2011. Many investors believe that CanRoys are the only solution that generates enough income for them to supplement Social Security. Actually you shouldn’t spend more than 4% of your portfolio every year. If you do, you are risking spending it all before you die, which is not a good solution for most retirees. It’s great to receive a 12% yield on cost, but you have to ask yourself how sustainable is that payment? What if the dividend is cut by 50%? Then you are only making a 6% yield on cost. If you are a retiree who is living off their portfolio, spending up to 4% of your portfolio would leave some unused balances to be reinvested and provide some buffer in bad years. If you need an income trust yielding 20% in order to retire, then you don’t have enough money to stop working. Dividend Growth investors tend to purchase the aristocrats and the achievers primarily for their smoothly growing dividend payments. Stock prices are volatile enough to stomach, thus a dependable and a growing stream of dividends is providing a safety cushion even during the worst bear markets over the past 70 years. If you also have volatility in dividends, then retirees can’t safely live off their investments. An income investor should not concentrate only in the sectors, which are traditionally the best yielding ones. For example dividend investors have traditionally bought utilities and financials for their stable yields. The 2007-2009 financial crisis has pretty much left financials out of the income investor’s radar screen. Canadian Income Trusts were very popular among income investors up until 2006 when Canada decided to gradually phase out the Income trust structure by 2011. Since then trusts have cut dividends across the board as their stock prices have collapsed. Pengrowth Energy Trust (PGH), which engages in the acquisition, ownership, and operation of working interests and royalty interests in oil and natural gas properties in Canada, currently yields 15.80%. The current monthly distribution of $0.081/share is 63% lower than last year’s payment. Penn West Energy Trust (PWE), which engages in acquiring, developing, exploiting, and holding interests in petroleum and natural gas properties and assets, yields 21% at the moment. The most recent monthly distribution of $0.187/share is 44% lower than last year’s payment. Advantage Energy Trust (AAV), which operates as an oil and natural gas exploration and development company, has discontinued distributions according to its most recent March 20 press release. Harvest Energy Trust (H T E), which engages in the exploitation and development of petroleum and natural gas properties in western Canada, has reduced its monthly distributions by 87% over the past year to $0.039/unit. The trust currently yields 11.50%. The lesson to learn is not to put all your investments in one basket, such as one sector for example. Remember the story of the tortoise and the hare – the slow and steady wins over time, not the hit or miss approach. Yet another notable dividend aristocrat raised its dividends last week following Procter and Gamble’s 10% dividend increase last week. 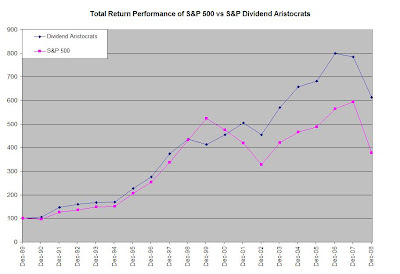 This brings the total year to date dividend increases in the S&P dividend aristocrats index to 18, versus only 5 dividend cuts so far in 2009. Johnson & Johnson (JNJ), which engages in the research and development, manufacture, and sale of various products in the health care field worldwide, announced a 6.50% boost in its quarterly dividend to $0.49 per share. Johnson & Johnson is a dividend aristocrat, which has rewarded its shareholders with an uninterrupted streak of increased dividends for 47 consecutive years. The stock currently yields 3.60%. Check out my analysis of Johnson & Johnson (JNJ). I would consider adding on to my J&J stake as long as the stock is below $65. Kellogg Company (K), which engages in the manufacture and marketing of ready-to-eat cereal and convenience foods., announced a 10% boost in its quarterly dividend to $0.375 per share, effective in the third quarter.. Kellogg Company is a former dividend aristocrat, which has fought back to regain its status of a dividend growth stock since 2005. The stock currently yields 3.50%. The board of The J. M. Smucker Company (SJM), which engages in the manufacture and marketing of branded food products, has approved an increase in its quarterly dividend from $0.32 to $0.35 per share. The J. M. Smucker Company has rewarded its shareholders with an uninterrupted streak of increased dividends since 2002. The stock currently yields 3.60%. Southern Company (SO), which operates as an energy company serving across the southeastern United States, announced a 4.20% raise in its quarterly dividend to $0.4375 per share. Southern Company has rewarded its shareholders with an uninterrupted streak of increased dividends for 7 consecutive years. The stock currently yields 5.90%. Suburban Propane Partners, L.P. (SPH), a master limited partnership which engages in the distribution of propane, fuel oil, kerosene, diesel fuel, gasoline, and refined fuels, as well as marketing of natural gas and electricity in deregulated markets, announced boost in its quarterly distributions to $0.815 per unit. Suburban Propane Partners, L.P. has rewarded its unitholders with an uninterrupted streak of increased dividends since 1999. The units currently yield 8.80%. Holly Energy Partners, L.P. (HEP), another master limited partnership which operates a system of refined product and crude oil pipelines, storage tanks, and distribution terminals primarily in west Texas, New Mexico, Utah, and Arizona, increased its quarterly distributions by 1.30% to $0.775 per share. Holly Energy Partners, L.P. has rewarded its unitholders with an uninterrupted streak of increased dividends for 5 consecutive years. The stock currently yields 12.10%. Hudson City Bancorp (HCBK), which operates as the bank holding company for Hudson City Savings Bank that provides a range of retail banking services in the states of New Jersey, New York, and Connecticut, announced a 7.10% boost in its quarterly dividend to $0.15 per share. Hudson City Bancorp has rewarded its shareholders with an uninterrupted streak of increased dividends for 9 consecutive years. The stock currently yields 4.90%. Cullen/Frost Bankers, Inc. (CFR), which provides various banking and financial products and services primarily in Texas, announced a 2.40% boost in its quarterly dividend to $0.43 per share. Cullen/Frost Bankers, Inc. is a dividend achiever, which has rewarded its shareholders with an uninterrupted streak of increased dividends for 15 consecutive years. The stock currently yields 3.60%. Abbott Laboratories manufactures and sells health care products worldwide. The companyis a component of the S&P 500 and is a dividend aristocrat, which has been consistently increasing its dividends for 37 consecutive years. Most recently Abbott raised its quarterly dividend payment by 11% to $0.40/share. From the end of 1998 up until December 2008 this dividend growth stock has delivered an annual average total return of 3.80% to its shareholders. At the same time company has managed to deliver an impressive 7.60% average annual increase in its EPS since 1999. 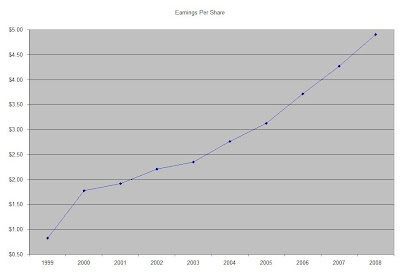 Analysts are estimating an increase in EPS to $3.65 in 2009 and $4.10 by 2010. The ROE has largely remained between 12% and 28% after falling from its 1999 highs over 34%. Annual dividends have increased by an average of 8.80% annually since 1999, which is higher than the growth in EPS. A 9 % growth in dividends translates into the dividend payment doubling almost every eight years on average. Since 1986 Abbott Laboratories has actually managed to double its dividend payment almost every six years on average. The dividend payout ratio has largely remained above 50% over the past decade, with spikes in 2001 and 2006 caused by lower earnings. A lower payout is always a plus, since it leaves room for consistent dividend growth minimizing the impact of short-term fluctuations in earnings. Abbott Laboratories is trading at a P/E of 14, yields 3.60% and has an adequately covered dividend payment. In comparison Bristol Myers Squibb (BMY) trades at a P/E multiple of 8 and yields 6.10%, while Johnson and Johnson (JNJ) trades at a P/E multiple 11 while yielding 3.50%. I like the strong product pipeline of the company, as well as the potential for new launches. There could be some generic competition for some of Abbott’s products but overall the forecast for future revenue increases is quite rosy. The recent acquisition of Advanced Medical Optics exposes the company in the rapidly growing market for LASIK and Cataract procedures. I am considering initiating a position in Abbott on dips. This is a guest post from Jae Jun from Old School Value. His blog is focused on value investing. In the current market, small caps are not the only companies that are undervalued or mispriced. Although the markets have risen substantially from its lows there are still bargains to be had, especially if your focus is on buying for the long run. Late last year, Forbes released their platinum 400 best big companies and 200 best small companies which is a fantastic source of finding undervalued bargains. Take for example the following companies which were reviewed and estimated on Dec 11, 2008. These are small to mid cap size companies so the price difference is to be expected, but todays market also has created many of the same opportunities within the large cap universe. Positive, consistent and growing cash flows. Consistent margins. Fluctuating/decreasing margins over several years will not be accepted unless the other criterias are outstanding. As I was going through each of the first 25 companies, I noticed there were many capital intensive companies with high debt loads. This is because Forbes ranked the companies based on ROE where having a high debt load can play a significant role. Also, the spreads between the current price and estimated price were much smaller as a percentage as these companies are heavily followed and more likely to trade closer to its fair value. Great company. Need I say more? Consistent margins, reduced debt, increased FCF/debt. Bottom line margins have not dropped too much. Strong profits in recession, increased margins significantly, metrics are up. Mining and natural resources is cyclical. FCF +ve past several years and margins increased. Good margin of safety but unpredictable. Cheap price could factor in the unpredictability. Great company. Need I say more? Incredible numbers. Oil company but FCF +ve for past 10 years, numbers and margins are excellent for this company. Excellent company and numbers but big drop in last year margins. There is a lot of skepticism about the plans of the Federal Government and the FED to defrost the credit markets through its many stimulus plans. One of the biggest fears for some investors is that pumping too much money in the system would lead to hyperinflation and a complete devaluation of the US dollar against hard assets such as gold, oil, land and others, which would eventually lead to everyone living in caves hunting for food. There are even several ETF tracking Gold (GLD, IAU) and Crude Oil (USO, OIL). I disagree with those fears. First of all I do expect average inflation of 3% annually for the next 3-4 decades to continue. The best way to hedge against that is to buy common stocks, which are not just pieces of paper, but rights to ownership of real businesses which would be able to pass any price increases on to their consumers. At the same time these businesses would share a portion of their profits with shareholders, by paying out dividends. Over the past 80 years dividend growth in the Dow Jones Industrials Index has more than compensated for the eroding forces of inflation. Dividend Growth for the 1920-2005 period was 4.9%, which was almost 2% higher than the 3% average inflation rate. The best ETF to track Dow Jones Index is Dow Jones Diamonds (DIA). Over the past few decades the wealth of US households has been primarily comprised of Real Estate, stocks and fixed income. The real estate has been the primary residence of families; stock ownership was through owning mutual funds or owning stocks directly, while the fixed income portion consisted of deposits, bonds and cash on hand. As the value of stocks and real estate rose steadily, consumers felt richer and spent more, which in turn stimulated the economy. The past 2 years however have brought low stock prices, and declining real estate values. According to some estimates, the total amount of stock market losses is estimated at 8 trillion dollars. No wonder many investors simply throw away their quarterly brokerage statements these days – their passive investments have plunged significantly in value. On the other hand, the housing bubble has eroded a total of 6 trillion in homeowners equity in the US. At the end of 2008, Americans' net worth fell $11.2 trillion, or 18 percent from 2007, to $51.5 trillion according to the Federal Reserve; which makes people less secure about their net worth situation. Investors have most of their wealth invested in real estate and stocks. When stock and real estate markets are booming, people feel wealthier, and tend to spend more. If homeowners wanted to redecorate their house or take a cruise around the world, they could easily sell their appreciated stocks or take a HELOC against their home equity. If they lost billions of their networth however, on aggregate they would be less likely to spend it all since they would have less assets to post as collateral in order to get the credit to live the nice life. 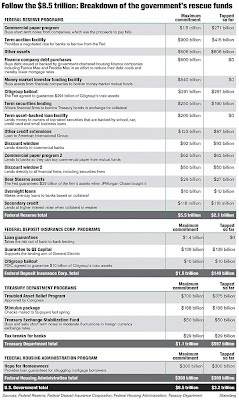 Thus in order to make people feel wealthier again, the government is spending several trillion in bailouts in order to lessen the negative wealth effects on the economy. As fewer consumers take out loans in order to spend on anything from decorating your house to going to that cruise to the Bahamas, and the ripple effects of this is felt throughout the economy there is less money to be loaned. Someone has to step in to provide a buffer against further declines in spending, and the government’s recent plans are a decisive action to prevent the worst from happening. Thus I disagree that the government bailout would lead to hyperinflation, such as the one we saw in Germany in the 1920s, Zimbabwe or in Eastern Europe in the early 1990s. If the private sector’s participation in the economy decreases, and the government’s participation increases and offsets the decline in the private sector, the net effect for the economy is zero. Another difference between US and the other hyperinflation situations is that the US dollar is a currency that virtually all countries in the world accept in their foreign trading. Not only that but the US dollar is the primary reserve currency for many large foreign central banks such as the Chinese, Russian and Japanese banks. These banks hold their US dollar reserves in US Treasury Securities. They don’t have another alternative for their reserves. If they sold all their dollars their currencies would be much more unstable and the countries would suffer a huge drop of confidence in their economies. Furthermore during economic crises most foreign individuals tend to purchase dollars. For example during the Asian financial crisis (1997-1998), Russians, Indonesians and others were converting their savings mostly into US dollars, not gold or silver. Thus I believe that the best way to protect your wealth is to purchase shares in consumer staples companies, whose products we use on a daily basis. I am a fan of Procter and Gamble (PG), Clorox (CLX), Colgate Palmolive (CL) and Johnson & Johnson (JNJ), which have not only been able to pass inflationary pressures onto consumers but are relatively recession immune as well. For a larger list of the best dividend stocks for the long run, check out this post. Dawn, Downy, Tide, Bounty, Charmin, Pampers, Folgers, Iams, Pringles, Gillette, MACH3, Braun and Duracell. The Cincinnati, OH company has increased dividends for 52 consecutive years and currently yields 3.30%. Check out my analysis of P&G (PG). Johnson & Johnson (JNJ) is the owner of some well knows brands such as SPLENDA, TYLENOL, SUDAFED, ZYRTEC, MOTRIN IB, and PEPCID AC. The New Brunswick, NJ company engages in the research and development, manufacture, and sale of various products in the health care field worldwide. If you are concerned about the US dollar depreciating, look no further – 49% of JNJ’s 2008 sales came from abroad. Johnson and Johnson (JNJ) has increased dividends for 46 consecutive years and currently yields 3.60%. Check out my analysis of JNJ. has rewarded stockholders with a rising dividend income stream for 46 consecutive years. This dividend champion currently yields 2.90%. I am considering initiating a position in CL on dips below $53. Clorox (CLX) manufactures and markets a range of consumer products such as Clorox, Formula 409, Glad, K C Masterpiece, Ever Clean. The Oakland, CA company has a 31 year uninterrupted streak of dividend increases. The stock currently yields 3.40. Check out my analysis of Clorox. Full Disclosure: Long PG, JNJ and CLX. The dividend aristocrats index has had five dividend cuts so far this year. Because of the way that the index is rebalanced, the dividend cutters will remain a part of the elite basket of S&P 500 companies which have consistently raised their dividends for over 25 consecutive years. Unless a member of the Dividend Aristocrats index is removed from the S&P 500, it won’t be removed from the elite income index. The five companies, which cut dividends so far in 2009, will most likely be booted out of the index at the annual December reconstitution. Back in February, General Electric (GE) lowered its quarterly payment to $0.10 from $0.31/share for the first time since 1938 in an effort to save 9 billion dollars annually and maintain its AAA rating. On February 5, the board of State Street (STT) announced that they would be cutting the quarterly dividend from $0.24/share to $0.01/share. STT joined the ranks of other financial institutions such as Bank of America (BAC) and Citigroup (C) with in this move to bolster liquidity. On February 25 Gannett (GCI) slashed its quarterly dividends by 90% to $0.04/share. The company is responding to the recession in US and UK by reducing the payout to shareholders, which will save it close to $325 million/year. The new dividend is a cent and a half lower than its first dividend in 1967 of $0.054/share. The move comes about a month after company executives said they would meet to evaluate the dividend. In early march US Bancorp (USB) board of directors cut the quarterly dividends by 88% to $0.05/share. The move wasn’t surprising since USB couldn’t cover its previous payment of $0.425 for the last two quarters. In November, USB received $6.6 billion from TARP. In December the bank failed to increase its dividend to shareholders for the first time 37 years. When Pfizer (PFE) announced its intention to acquire pharmaceuticals rival Wyeth (WYE) in order to extend its portfolio of drugs, the company cut its dividend payment in half. This helped the company keep cash in order to finance the deal. A consortium of banks has also provided commitments for a total of $22.5 billion in debt, $22.5 billion in cash and 23 billion in equity. Despite the fact that these companies are still members of the S&P Dividend Aristocrats index, they will be removed from it by the end of the year. Although Value Investors could find some of them attractive at current levels, dividend growth investors have little incentive to acquire any of them until new policies of consistent dividend growth, supported by healthy increases in the bottom line, are being implemented. There has been an interesting trend in mainstream financial media to portray most dividends as unsustainable. This is further fueled by statistics from Standard & Poors, which shows that dividends are being cut at the fastest pace since 1955, and rumors about the shrinking universe of dividend growth stocks. Enterprising investors who look past those fearing statistics and view it as a contrarian buy signal would find a lot of consistent dividend raisers who keep on delivering good results to shareholders. After all, companies which have increased dividends for more than a quarter of a century have a sound cash flow management policy in place which has the shareholders best interest in mind, as opposed to empire building at all costs, excessive management bonuses and wasting stockholder value on unprofitable projects. Anworth Mortgage Asset Corporation (ANH). Procter & Gamble (PG), which engages provides branded consumer goods products worldwide, announced a 10% raise in its quarterly dividend to $0.44 per share. Procter & Gamble is a dividend aristocrat, which has rewarded its shareholders with an uninterrupted streak of increased dividends for 53 consecutive years. The stock currently yields 3.50%. Check out my analysis of Procter & Gamble (PG). I would consider adding on to my P&G stake as long as the stock is below $59. Enterprise Products Partners L.P. (EPD), a master limited partnership, which provides services to producers and consumers of natural gas, natural gas liquids (NGL), crude oil, and petrochemicals, raised its quarterly distributions to $0.5375 per unit. This represents the 28th distribution increase since Enterprise’s initial public offering in 1998 and its 19th consecutive quarterly increase. This midstream MLP currently yields 9.50%. H.B. Fuller Company (FUL), which manufactures and markets adhesives and specialty chemical products worldwide, boosted its quarterly dividend by 3% to $0.068 per share. H.B. Fuller Company is a dividend achiever, which has rewarded its shareholders with an uninterrupted streak of increased dividends for 40 years. The stock currently yields 1.50%. People's United Financial (PBCT), which provides commercial banking, retail and small business banking, and wealth management services to individual, corporate, and municipal customers, raised its quarterly dividend from $0.15 to $0.1525 per share. People's United Financial has rewarded its shareholders with an uninterrupted streak of increased dividends for 15 consecutive years. The stock currently yields 3.50%. Anworth Mortgage Asset Corporation (ANH), a real-estate investment trust that invests primarily in United States agency mortgage-backed securities issued or guaranteed by United States government Anworth Mortgage Asset Corporation sponsored entities, such as Fannie Mae or Freddie Mac, boosted its quarterly dividend to $0.30 per share. The stock currently yields 18.20%. I continue seeing dividend aristocrats raising dividends in 2009. Master Limited Partnerships are another bright sector for dividend increases. It is also interesting to see financial companies such as People's United Financial and Anworth Mortgage Asset Corporation raising payouts. Most investors view stocks as lottery tickets – they buy and hope for the greater fool theory to kick in order to sell at a profit. More often than not however these investors lose a lot of money in the stock market, as they never seem to learn that stocks represent small portions of a business, which sells products or services and hopefully earns a decent profit while building on to its asset base. Many investors have taken a beating recently, especially as the recession and bear market kicked in earlier in 2008. Some are bailing out of stocks completely, while seeking the relative safety of Treasury Bonds or Certificates of Deposit. Some investors however have seen the current bear market as an opportunity to load up on cheap stocks, which are trading below the net levels of cash on their balance sheets. The net-net strategy was popularized by Ben Graham who bought stocks after the Great Depression at steep discounts to the net asset values per shares realizing huge profits in the process. Imagine a company ABC that has 1 million shares issued and outstanding trading at $0.50/share, has zero debt and no liabilities, and also has $1 million in cash and equivalents on its balance sheet. Now further imagine that the company is at least breaking even in terms of earnings. Would you pay $0.50/share for an asset that has a value of at least $1.00? Now the answer is not as straightforward since one needs to determine what catalyst would bring the price closer to $1.00. If the company decides to spend the cash on an ill-fated venture, then the value of the stock would drop. However if the company decides to liquidate or pay a special dividend to shareholders, then the stock should be worth more than $0.50/share. Back on March 16, FortuNet (FNET) announced that it would ask shareholders to approve a special $2.50 cash dividend on its April 17 meeting. As a result the stock price rallied 75.2% in a single day to $2.40/share. FNET earned $0.25/share in 2008 and has almost $2.75/share in total cash and investment securities as of 12/31/2008. Back on December 5 Eden bioscience (EDEN) announced it would be winding down its operations. The stock rallied 77% on the news. The company had $1.80/share in cash. A potential issue is that winding down operations could cost money. A company I am currently looking at from a value-investing standpoint is TheStreet.com (TSCM). Currently the online stock market content provider has $72.4 million in its coffers, versus total liabilities of $19 million, for a net $53.4 million or $1.76/share in cash. I like the fact that TSCM is paying out a quarterly dividend of $0.025/share. I would be interested in TSCM on dips below $1.50. The following post was written by Saj Karsan. Saj regularly writes for Barel Karsan, a site dedicated to finding and discussing value investments, and applying logic to investment decisions (as opposed to falling prey to psychological biases). In an "efficient market", all stocks are fairly priced by the market. If the US stock markets are efficient, and many finance industry professionals believe this to be the case, one cannot generate index-beating returns except through luck. However, if we were in an efficient market, it seems hard to believe that stock prices for even the most stable of companies should fluctuate so drastically from year to year and even from week to week. Yet that is exactly what happens. Consider Best Buy (BBY), a US-based multi-national electronics retailer. It has generated consistent returns year after year, and has a low debt to equity ratio resulting in minimal financial risk. Yet it's stock price has fluctuated dramatically, offering astute investors the opportunity to achieve enormous returns. 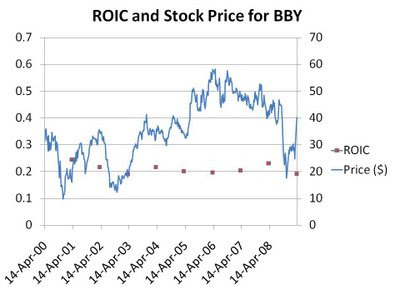 While ROIC has been predictable and consistently range bound for the last several years, the stock price has been anything but. It seems hard to believe that the market is efficiently pricing this security when its price can fluctuate wildly in relatively short periods of time while the company itself generates predictable earnings on capital. For example, if the company is worth X amount in early 2000, how does it become worth just one quarter of this amount 3 months later, and then three times this amount six months after that? More recently, three months ago the market valued Best Buy at $7 billion, but now values it at $16 billion! Investors who recognized the mispricing have seen returns of over 100% in a 3 month period! We've also seen other examples of this phenomenon: we've looked at graphs illustrating wild fluctuations in the historical P/E ratios of Coke and Walgreen, for example, which have allowed value investors to buy in at tremendous discounts. Value investors willing to put psychological bias aside and instead invest at the height of the market's fear can indeed achieve above average returns. If this topic interests you, consider subscribing to the Barel Karsan feed. - Telling the truth or being positive? Last week Wells Fargo (WFC) reported better than expected first quarter EPS of $0.55/share. If the company manages to maintain earnings at the current rate, the annual EPS would jump up to $2.20/share. That puts the forward P/E ratio at 9, which is pretty low, and makes the stock pretty attractive at current levels. At the same time however Wells Fargo has cut its quarterly dividends from $0.34/share to $0.05/share. At the current stock price shareholders are getting a mere 1% yield. If things were really as great as the most recent quarterly report suggested, then the dividend should not have been cut so severely. Dividends are typically real cash that companies pay out to their shareowners. Unlike earnings, which could be manipulated back and forth to show rosy sand castles, dividends are real cash that cannot be created out of thin air. Thus management commitment to a dividend policy of consistent increases shows confidence in the business model of the company and its ability to allocate cash flows effectively. If the situation was that great at Wells Fargo, then the company doesn’t expect these record profits to be sustained over the course of the next few quarters, based off the severity of the dividend cut in March. Now some analysts would claim that the dividend cut was necessary in order for Wells Fargo either to have the cash to repay the treasury’s TARP money earlier, to maintain its Tangible Common Equity Ratio, or to conserve cash as financing is difficult to obtain during a credit crunch. Even if management really believed that operating momentum is sustained and that annual earnings per share would grow at double-digit rates, unless the board decides to share the new prosperity with shareholders by raising the dividends or buying back stock, investors have few tangible options to profit from the prosperity. Of course stock prices could go higher if earnings go higher, but that’s not always the case. If you are betting on the greater fool theory to profit in the stock market however, you might join the crowd of 90% of active traders who consistently lose money. If you want to invest intelligently and not speculate blindly, you would pass Wells Fargo at this moment. I do have high hopes for the company and would consider purchasing stock in it when the dividend growth policy is re-instituted. Until then there are many other opportunities for slow and steady total returns with much less risk considering. One of my main objectives as a dividend growth investor is to seek investments which have a strong business model that throws out enough cash flow that could support consistent dividend increases. My secondary objective is managing risk within my portfolio, by eliminating stocks, which have cut their dividends, by not reinvesting the dividends in companies that freeze their dividends and by diversifying my investments across sectors, asset classes, strategies and time. So far, based off my research of performance of dividend stocks based on company policy in addition to my experience over the past few years, I have been able to grow my income stream successfully. General Electric (GE) failed to increase its dividends on December 2 when the stock was trading at $17.61. The company cut its dividends on February 27, when the stock was trading at $8.51. State Street (STT) announced that it wouldn’t be raising its dividends on December 18, when the stock was trading at $39.06. The company cut its dividends on February 5 when the stock was trading at $27.54. Gannett (GCI) failed to increase its dividends on July 31, while the stock was trading at $18.12. The company announced a 90% dividend cut on February 25, when the stock was trading at $3.75. Pfizer (PFE) failed to reward shareholders with an increase in dividends on December 15, when the stock was trading at. The company announced merger talks with Wyeth on January 26 as well as a 50% reduction in dividends, which drove the share price to $15.65. Bank of America (BAC) affirmed its payment on July 23 when the stock was trading at $33.30. The bank cut its dividend on October 6 when the stock was trading at $32.22. In all cases, selling after the announcement of a dividend freeze would have saved you from suffering further losses, especially if you had been waiting for the dividend cut news to sell your stock. In both cases I am holding on to the stocks, as long as the dividends are not cut. After reading the article by DividendsValue I hesitated whether to hold on or to sell. After comparing returns of stocks with unchanged dividends to dividend growers and initiators I found that a dividend freeze might not be a bad thing. Furthermore I doubt that one should adjust their portfolio strategy based to follow the past market action too closely. In the past stocks like WYE, K, UST, GIS have frozen their dividends, but several years later resumed growing their payments. All of them were members of the elite dividend aristocrats index, and got kicked out for keeping their dividends unchanged. Wyeth (WYE) failed to increase its dividends in 2000 a three-year losing streak in the mergers and acquisitions game for WYE. The company began increasing its dividends again in 2005. The ten year average annual dividend growth is 3.30%. Wyeth is currently in merger talks with Pfizer, as it is one of the few pharma stocks which are actually holding a stable pipeline that delivers drugs to the market. Kellogg (K) kept its dividend unchanged for over 6 quarters before it was kicked out of the S&P Dividend Aristocrats index in 2002. This was due to the timing of dividend increases by the company. In 2005 Kellogg started raising its dividends once again. The average annual dividend growth for the company is 4.20%. US Tobacco (UST) didn’t increase its quarterly dividend in 1997 and kept it unchanged until early 1999. After that followed a decade of consistent dividend growth of 4.60% annually and a buyout by Altria Group (MO) in 2008. General Mills (GIS) failed to raise its dividend in 2000 and kept it unchanged until August 2004. Nevertheless the Minneapolis, MN based manufacturer of branded and packaged consumer foods managed to deliver an annual average dividend growth of 5.10% over the past decade. An investor has to ask himself or herself what happens if a company freezes its quarterly dividends, and 5 quarters later it increases the dividends again? On an annual basis your dividend income from the stock could still be increasing. I wouldn’t like to optimize my strategy solely based off the performance in recent years. As a dividend growth investor an unchanged dividend is not necessarily bearish news for me. Most companies don’t raise their dividends every year, but still could achieve a decent dividend growth rate. If I could exit the position at least at breakeven however, I would most probably invest in companies which could support an increasing dividend payments even during cyclical downturns. - Should you sell after a dividend cut? Many investors have been running away scared from dividend growth investing, after reading the recent harsh statistics from Standard & Poors, which claimed that 1Q 2009 was the worst quarter since 1955. Most investors who got scared from these statistics seem to forget that dividend investing and investing in general is a long term process, not a matter of timing the intraday ticks on the S&P 500. In order to be successful at investing, one has to stick with their strategy and purchase only those dividend stocks, that would create a diversified basket of companies. When combined together, this portfolio should withhold the bear market forces, and throw off a decent amount of dividend income over time. Despite all the negative publicity that dividends are getting, one could still find companies that actually raise their dividends. Tanger Factory Outlet Centers (SKT), a real-estate investment trust which engages in acquiring, developing, owning, operating, and managing factory outlet shopping centers, raised its quarterly dividend from $0.38 to $0.3825 per share. Tanger Factory Outlet Centers is a dividend achiever which has rewarded its shareholders with an uninterrupted streak of increased dividends for 16 years. The stock currently yields 4.40%. Plains All American Pipeline (PAA), a master limited partnership which engages in the transportation, storage, terminalling, and marketing of crude oil, refined products, and liquefied petroleum gas and other natural gas-related petroleum products, raised its quarterly distributions by 4.6% to $0.905 per unit. Plains All American Pipeline has rewarded its shareholders with an uninterrupted streak of increased dividends for 9 years. The units currently yield 9.20%. Genesis Energy (GEL), a master limited partnership which operates in the midstream segment of the oil and gas industry in the Gulf Coast area of the United States, raised its quarterly distributions by 2.3% to $0.3375 per unit. Genesis Energy has rewarded its shareholders with an uninterrupted streak of increased dividends since 2004. Genesis Energy has cut its distributions in 2000 and 2003. The units currently yield 11.50%. I would not initiate a position in Genesis Energy at these levels. TJX Companies (TJX), which operates as an off-price retailer of apparel and home fashions, raised its quarterly dividend from $0.11 to $0.12 per share. TJX Companies is a dividend achiever which has rewarded its shareholders with an uninterrupted streak of increased dividends for 13 years. The stock currently yields 1.70%. It’s interesting to note despite the credit market crunch, there are still some real estate investment trusts which keep rewarding shareholders with dividend raises. The master limited partnerships have also accounted for stable and consistent increases in distributions as of late. United Technologies Corporation provides technology products and services to the building systems and aerospace industries worldwide. United Technologies is a major component of the S&P 500 and Dow Industrials indexes. The company is also a dividend achiever, which has been consistently increasing its dividends for 15 consecutive years. From the end of 1998 up until December 2008 this dividend growth stock has delivered an annual average total return of 8.70% to its shareholders. The ROE has remained largely between 20% and 25% with the exception of a temporary dip in 1999 to 14%. Annual dividends have increased by an average of 15.10% annually since 1999, which is lower than the growth in EPS. A 15 % growth in dividends translates into the dividend payment doubling almost every five years. Since 1970 United Technologies has actually managed to double its dividend payment almost every eight years on average. The dividend payout has largely remained below 30% over the past decade. A lower payout is always a plus, since it leaves room for consistent dividend growth minimizing the impact of short-term fluctuations in earnings. In addition to that UTX has sufficient cash flow to maintain and even increase the dividend in 2009. United Technologies is currently attractively valued. The stock trades at a P/E of 9, yields 3.50% and has an adequately covered dividend payment. I would be a buyer of UTX at current prices, as long as it does not increase above $51.50. The current bear market has been a heaven for sellers of covered calls. I have mentioned earlier the pros and cons of selling covered calls. Typically I am not a big believer in cutting my profits and lowering my risk reward expectancy in exchange for the options premium. Furthermore I would hate to have a situation where a stock I like is called in and I would have to buy it back at higher levels. Covered Calls do make sense to me however for a stock that has either not increased its dividend or for stocks in which I have a large paper loss. Let us look into the first example, where one is sitting at a paper loss and they are willing to decrease it. The severity of the loss that would make you sell covered calls varies from individual to individual based off their risk tolerance. Let’s look at US Bancorp (USB) for example. The stock has been punished this year after losing more than half of its value year to date as investors are losing trust in the US financial system. In addition to that US Bancorp recently cut its dividends by 88%, which was a major red flag and a sell signal for me. If you are still holding on to that position however, waiting for the upturn in the company’s financial situation, selling covered calls against your position might be the only way to generate more income from the stock. USB was largely trading in a range between $25 and $35 over the past five years, right before the financial crisis started. A dividend growth investor who dollar cost averaged their way into the stock over the past year could have easily bought the stock between $8 and $35/share. Since October 2008 USB shares have lost close to two thirds of their value. Assuming an average cost of $20, this investor would be sitting at a large paper loss at yesterday’s close at 14.45. Assuming the investor still plans on holding on to the stock, while generating extra income, they could simply decide to sell a covered call with a strike of $20, and an expiration date that would generate some decent income. If called in, the investor would be obligated to sell his stock to the covered call buyer at the strike prie. This being the case, selling a covered call at prices below one’s cost basis would certainly bring losses if shares were called in. Looking at different expirations for calls on USB stock with a strike price of $20, it seems that the highest prices could be obtained for calls that expire in January 2010 and January 2011. Selling the January 2010 call with a strike at $20, would generate about $210 for every 100 shares held before commission expenses. Selling the January 2011 call with a strike at $20 would generate $310 for every 100 shares held before commissions and other expenses. The first example would increase the yield on cost by almost 10%. The second example would lock in the obligation to sell at $20 by an extra year, but would bring incrementally a higher cash flow. There have been many stocks which have lost a substantial amounts in short periods of time. If you are looking forward to increasing your income from stocks which have failed to increase their dividends or even worse have cut it, then selling covered calls could be a solution for you. Just like any other stategy however, learn as much as possible about it, before deciding if it is appropriate for you or not. The big news yesterday was the failed merger talks between Sun Microsystems and IBM. Sun Microsystems (JAVA) lost almost 23% of its value after the news hit the street. JAVA exploded on March 17 after rumors of a potential bid by IBM made Sun’s shares 79% more expensive. The major sticking point was that Sun Micro believed IBM’s rumored offer of $9.40 to be too low. This news should be a lesson for all would be merger arbitrageurs to never initiate a position in an arb deal before the deal has been announced officially. Without a clear written intent from both companies, there is added uncertainty whether the deal would go through in order for the arbitrageur to close their position at a profit. That’s why arbitrageurs should expect higher risk adjusted returns if they waited for the official announcement of the deal before deciding whether the deal is worth participating in or not. Another example of a badly timed merger arb play was the talks between Yahoo (YHOO) and Microsoft (MSFT) early in 2008. Back in February 2008, MSFT proposed to acquire YHOO for $31/share, which was a 62% premium to the closing price for the dot com company. After the announcement Yahoo jumped by 48% to 28.38. Check out my analysis of MSFT. After three months of uncertainties however Microsoft decided that Yahoo (YHOO) valued itself too much and withdrew from negotiations, sending Yahoo shares down 15% for the day. Investors and institutions which bought Yahoo (YHOO) stock around $28.38 expecting to make an easy 9% gain were hugely disappointed. As always, once the intent of BOTH companies is announced in favor of the deal and all the details have been accepted by both companies, should one consider initiating a merger arbitrage play. Otherwise, you would be speculating, which is not what Ben Graham and Warren Buffett preach as a winning investment philosophy. There were few dividend increases last week. The companies that raised their payments were WSO, EWST and MFA. Energy West (EWST) raised its monthly dividend payment to $0.045 from $0.04. The distributor and seller of natural gas to end-use residential, commercial, and industrial customers in the United States has been consistently raising its dividends since 4Q 2005 and currently yields 6.80%. MFA Financial (MFA) raised its quarterly dividends to $0.22/share from $0.21. The company primarily invests in mortgage-backed securities (MBS) that include hybrid and adjustable-rate MBS (ARM-MBS). The dividend is pretty volatile and despite the high current yield of 14.30%, it doesn’t seem worthy of income consideration at this moment. Watsco (WSO), which distributes air conditioning, heating, and refrigeration equipment, raised its quarterly dividends for a 6th year in a row to $0.48/share. The 5 year average dividend growth is 36.1% annually. WSO would be an interesting addition to a dividend growth portfolio if it reaches a 10-year streak of consistent dividend increases 3 years from now. The stock currently yields 4.90%. Despite the slow week for dividend increases, I am looking forward to a busy April, since historically some well-known dividend aristocrats tend to raise their dividends during the current month. S&P 500, which is the benchmark against which most money managers track their performance, lost 11.67% in the first quarter of 2009. The S&P Dividend Aristocrats however underperformed the benchmark by almost 2% after losing 13.84% in the first quarter. Now if we add dividends to the picture the S&P 500 loss drops to 11.01% while the loss for Dividend Aristocrats decreases to 12.90%. The average performance of S&P 500 dividend payers was much lower than non-dividend payers in the S&P 500 for the first quarter -12.99% versus – 0.23%. The S&P is expecting dividends on the S&P 500 to drop to $21.92 in 2009 versus $28.39 in 2008. With expectations for dividend cuts across the board, investors who are looking to scoop bargains at depressed prices are seeing lots of opportunities. In their fear of dividend cuts some investors are putting all dividend payers in one basket. Just because one sector cut its dividends however, does not mean that all sectors will cut dividends. There are certainly dividend stocks, which won’t cut their dividends anytime soon. Some are even increasing them, despite the “worst crisis since the Great Depression”. Long term investors who focus on the big picture instead of focusing on intraday ticks would most likely be rewarded with double digit yields on cost two decades from now. Companies with wide moats, which have strong competitive advantages that enable them to reward shareholders with consistent dividend growth, have outperformed the S&P 500 over the past 20 years. The best performers so far this year include discount retailer Family Dollar (FDO), chemicals companies Rohm and Haas (ROH) and Air Products and Chemicals (APD) as well as the drug store chain Walgreen (WAG). Some of the worst performers include this years dividend aristocrats, which have cut their payments to shareholders. Names like Ganett (GCI), General Electric (GE), US Bancorp (USB), Pfizer (PFE) and State Street (STT) are some of this years worst performers. The companies will certainly be booted out of the index by the end of the year. One of the flaws in the S&P Dividend Aristocrats index is that it keeps any dividend cutters in the list until the annual rebalancing in December or until the stock is dropped from the S&P 500. Back in December 2008 several US and Canadian Bloggers provided four of their best stock picks for 2009. The rules of the stock-picking contest do not allow actively trading stocks. The performance of the individual bloggers’ picks is reviewed every quarter. You might recall that I selected four high yielding dividend stocks from different sectors which I believed have sustainable dividend payments for 2009. Check out my original post for the rationale behind my picks. Realty Income (O) closed 2008 at $23.15. At the current price of $18.82 plus the $0.42525 in distributions collected during the first quarter the investment in the owner of commercial retail real estate properties in the US is underwater by 16.90%. This dividend achiever, which has consistently increased its distributions multiple times/year since 1994, currently spots a very attractive 9.50% yield. Check out my analysis of Realty Income. Kinder Morgan Energy Partners (KMP) finished 2008 at $45.75. At the current price of $46.72 plus the $1.05 in distributions collected during the first quarter the investment in the owner of energy transportation and storage assets in the US is up by 4.40%. This dividend achiever, which has consistently increased its distributions several times/year since 1997, currently spots a very appealing 9.00% yield. Check out my analysis of Kinder Morgan. Consolidated Edison (ED) ended 2008 at $38.93. At the current price of $39.61 plus the $0.59 in dividends collected during the first quarter the investment in this provider electric, gas, and steam utility services has gained 3.30%. This dividend aristocrat, which has consistently increased its distributions several times/year since 1975, currently spots an attractive 6.10% yield. Check out my analysis of Consolidated Edison. Phillip Morris International (PM) finished the year at $43.51. At the current price of $35.58 plus the $0.54 in dividends collected during the first quarter the investment in manufacturer of cigarettes and other tobacco products in markets outside of the United States of America is underwater by 17%. This dividend stock currently spots an attractive 5.60% yield. Overall the four dividend stocks that I picked lost 8.30% so far in the first quarter of 2009; if you add in the dividends received over the first quarter of the year the total return improves to a negative 6.50%. In comparison S&P 500 lost 11.25% in the first quarter of 2009. I would like to reiterate the fact that in order to generate dividend income for the long run, a more diversified portfolio consisting of at least 30 stocks should be constructed. Check out the Best Dividend Stock for the Long Run list, which is a good addition to today's post.